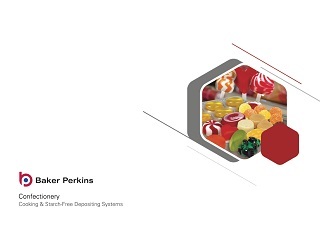 Baker Perkins' ServoForm™ Jelly is a range of high output continuous depositing systems for jellies, gummies and fruit snacks. Metal, silicone rubber or plastic moulds are used in place of starch moulds and the products do not require drying. Compared with starch moguls, the process is completely hygienic and production costs are significantly lower. 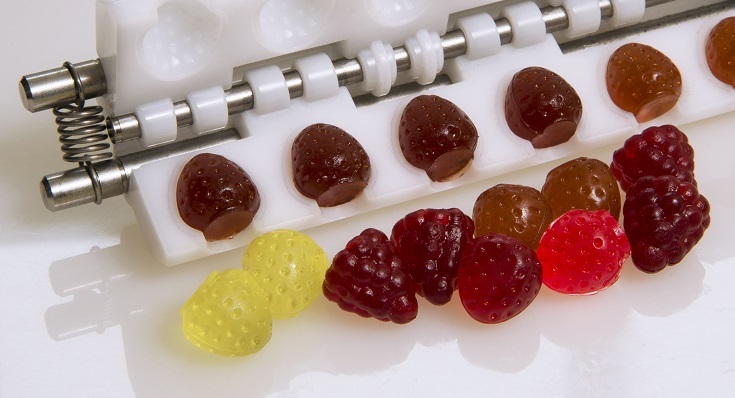 Starchless moulding is the most cost-effective method for the production of jellies, gummies and fruit snacks. Small footprint, low energy costs and elimination of starch reduce capital and running costs - particularly at lower outputs - making it ideal for both established manufacturers and new entrants to the market. Depositing delivers the highest levels of product quality and consistency while its capability to produce solid, striped, layered and filled confectionery in either 2D or full-form 3D formats opens up new avenues for creative product development. Being completely hygienic and capable of validation it is suitable for all types of functional, medicated and pharmaceutical confectionery. 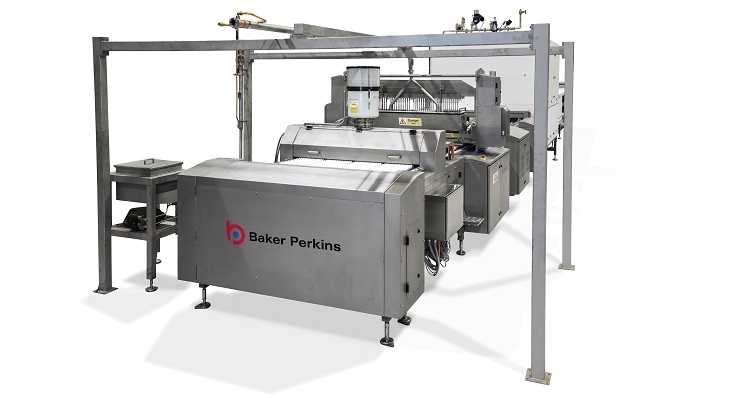 Baker Perkins can assist with every stage of bringing a new product to market. In addition to supplying the process technology for cooking and depositing we can advise on ingredients, formulation and process parameters as well as carrying out product and process development trials in our innovation centre. We work with leading suppliers of pectin, gelatin, carrageenan and starch to develop quick-setting formulations for the full range of jelly and gummy textures. Simultaneous production of several variants is possible. Products may be made from fruit or vegetable paste, or other ingredients derived from natural sources. Metal, silicone rubber or plastic moulds take the place of starch and products are deposited at final moisture. Energy consumption and labour costs are reduced as no drying is required. Capital cost is also lower as less equipment and floor space is needed. 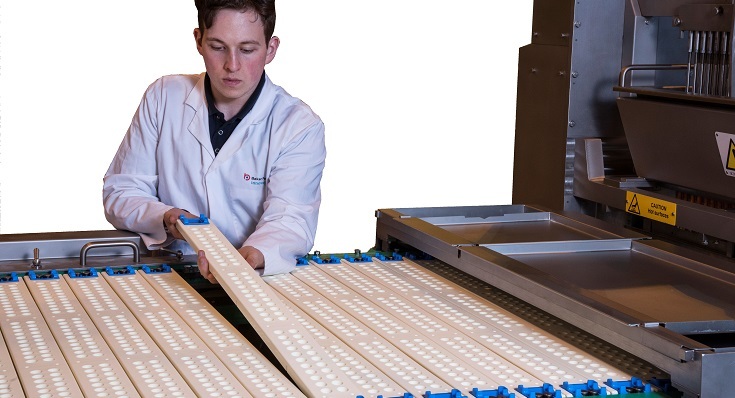 ServoForm™ depositors combine the benefits of continuous production with a starch-free process to deliver the highest levels of quality, output and efficiency to the manufacture of unique, high-quality confectionery. 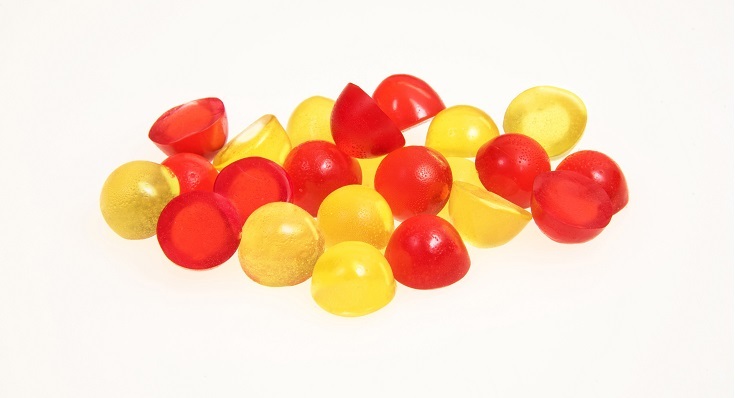 One-shot depositing of up to four colours or components in 2D or 3D formats enables the creation of a vast array of visually appealing candies with exciting taste and texture combinations to be created. 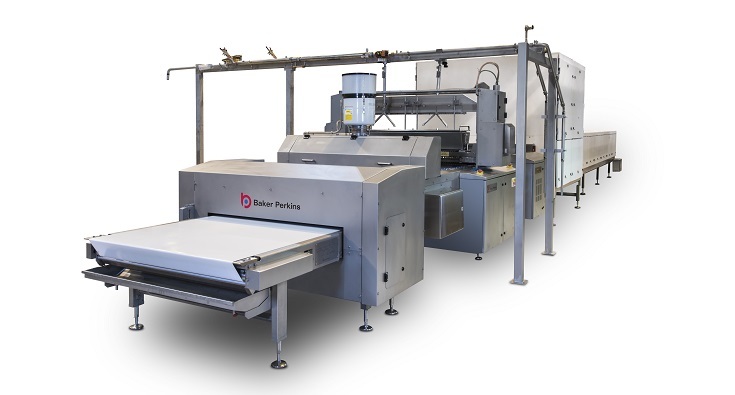 Evenly heated and fully self-draining to improve product flow, minimise waste and reduce cleaning time. Low retention time minimises process inversion. 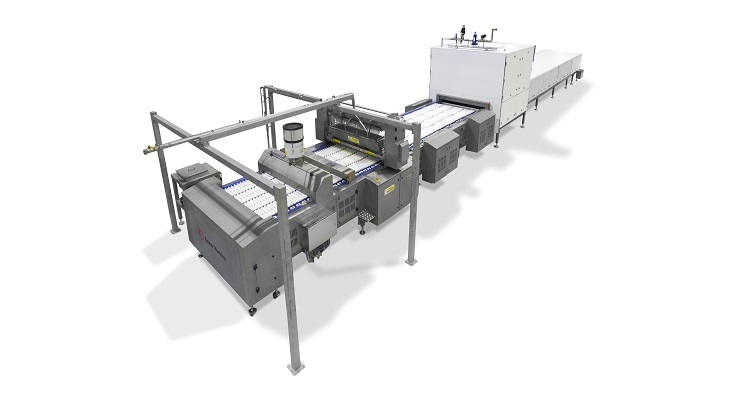 Full servo control provides high running speeds and accurate, sustained control of precise product dimensions and weight with negligible scrap rates, as well as allowing simultaneous production of different shapes, flavours and colours at high outputs. Minimise product tailing to allow multi-colour or multi-component products. Full process visualisation, recipe management and alarm handling. Refrigerated cooling tunnels for soft confectionery are sized to minimise cooling times based on product weights and throughput. Variable speed fans match the cooling profile to product. 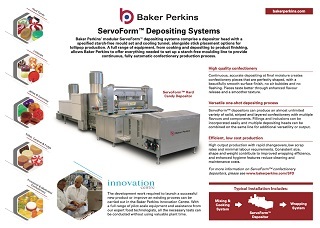 Baker Perkins’ ServoForm™ depositors enable the starch-free production of confectionery for the healthcare and supplement markets. 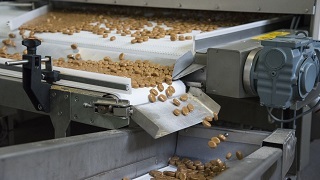 The hygienic, starch-free process is ideal for pharmaceutical products where validation is required. Vitamins, minerals, fibre and energy supplements can be incorporated to hard or soft products that can be sugar-free and less than 1% fat. 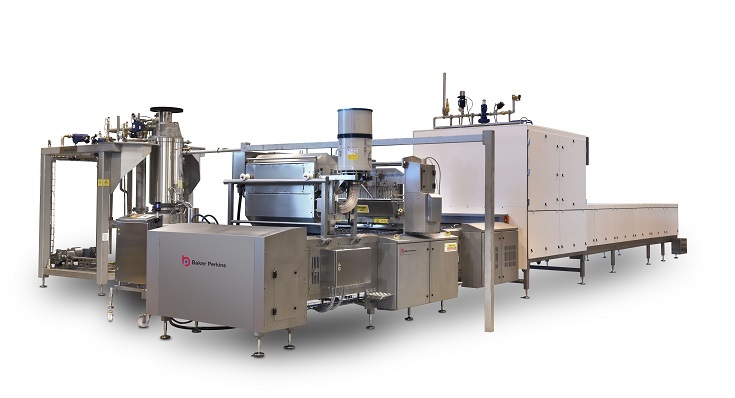 The ServoForm™ system is particularly suitable for products where validation of the process is required: the process is consistent and repeatable, there is no recycling of starch and the equipment is hygienic and easily cleaned. Create value-added end products that appeal to health conscious consumers. Existing product ranges can be diversified using real fruit ingredients: ideal for positioning in emerging healthy snack categories.